© Feng et al. ; Licensee Bentham Open. Tianma is a traditional Chinese medicine (TCM) often used for the treatment of hypertension and heart diseases. To elucidate the function of tianma at the molecular level, we investigated the effect of tianma on vascular functions and aortic protein metabolism. We found that long-term treatment with tianma (~2.5g/kg/day for three months) in one-year-old rats could enhance acetylcholine (ACh)-induced vasorelaxation in endothelium-intact thoracic aortic rings against both KCl (80 mM)- and phenylephrine (PE)-induced contraction. By using the iTRAQ (isobaric tag for relative and absolute quantification) technique, we confirmed from the functional data at the proteome level that tianma treatment down-regulated the expressions of contractile proteins (e.g. Acta2) and other related structural proteins (e.g. desmin), and up-regulated the expressions of extracellular matrix (ECM) glycoproteins (e.g. Fbln5) and anti-thrombotic proteins (e.g. Anxa2) in aortic tissue. By inductive reasoning, tianma could perform its vasodilatory effect not only by inhibiting vascular smooth muscle contraction, but also by enhancing blood vessel elasticity and stabilizing the arterial structure. Thus, tianma might become a novel therapeutic herbal medicine for cardiovascular diseases by regulating the aortic proteome metabolism. Keywords: Tianma, Vascular disease, Aorta, TCM. The research, development and use of natural products as therapeutic agents, especially those derived from higher plants, have been increasing in recent years. Traditional Chinese medicine (TCM) involves thousands of herbs for clinical treatments [1-3]. However, the underlying molecular and cellular mechanisms of most herbal medicines remain obscure. Tianma is the tuber of an orchid, Gastrodia elata Blume, and has been used as an ancient Chinese herbal medicine for treating various cardio- and cerebro-vascular and nervous diseases, including convulsion, headache, epilepsy, hypertension and coronary heart diseases [4-6]. Tianma contains many bioactive components such as vanilline, gastrodin, daucosterol, citric acid, succinct acid, parishin and minerals [7-11]. Besides its well known neuroprotective effects , tianma also plays a role in vascular circulation through controlling the functions of vascular smooth muscle cells (VSMCs) and inhibiting platelet aggregation . Cardiovascular remodeling caused by VSMCs overgrowth in the large and medium size vessels contributed to the pathogenesis of hypertension and restenosis after angioplasty [14, 15]. &#xB;Tianma was found to inhibit VSMCs proliferation through decreasing the expressions of proliferating cell nuclear antigen (PCNA) and c-myc, thus inhibiting cardiovascular remodeling . Tianma could also elicit relaxant effects on smooth muscles in the blood vessels, gastrointestinal tract  and bladder  directly or through inhibiting neurogenic contraction. In order to comprehensively understand the potential mechanisms by which tianma regulates vascular functions, we investigated the vasodilatory effects of tianma on vascular smooth muscles by measuring the KCl- and phenylephrine (PE)-induced contractility of rat thoracic aorta ex vivo using myography. We then quantitatively analyzed the proteomic changes of arterial smooth muscle cells using iTRAQ (two-dimensional (2D) liquid chromatography coupled with tandem mass spectrometry (2D-LC-MS/MS)-based multidimensional protein identification technology combined with multiplex isobaric tag for relative and absolute quantification ) after long-term tianma treatment of one-year-old rats. The selective iTRAQ-detected changed proteins were further confirmed at the protein level by using western blot analyses (Fig. 1). Our experimental results showed for the first time that tianma could dilate blood vessels through regulating the cellular protein metabolism, including contractile/structural proteins as well as extra-cellular matrix glycoproteins and anti-thrombotic proteins. Schematic representation of the experimental design and the quantitative proteomics analyses showing biological and technical replicates. Following tianma treatment (batches B-I (5 rats) and B-II (5 rats): +T; control = B-I (5 rats) and B-II (5 rats): -T) and aortic tissue lysis, protein extracts were acetone precipitated and quantified. These were then run in SDS-PAGE and subsequently digested. 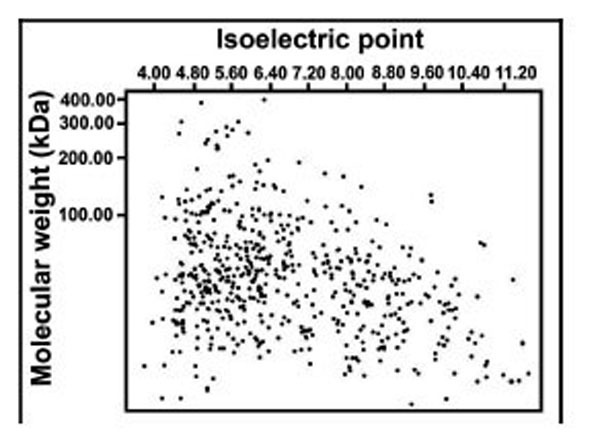 The quantitative proteomics analyses of aortic tissue lysates were performed by labeling with multi-plex isobaric tags (114, 115, 116 and 117) for relative and absolute quantification (iTRAQ) followed by Electrostatic Repulsion-Hydrophilic Interaction Chromatography (ERLIC)-based fractionation, and liquid chromatography coupled with tandem mass spectrometry (LCMS/ MS)-based multidimensional protein identification technology. The obtained data was analyzed using ProteinPilot software and validated by quantitative western blots. Finally, proteins were functionally classified into various subgroups. Unless indicated, all reagents used for biochemical methods were purchased from Sigma-Aldrich (St. Louis, MO, USA). Materials and reagents for SDS-PAGE (sodium dodecyl sulfate-polyacrylamide gel electrophoresis) were from Bio-Rad (Bio-Rad Laboratories, Hercules, CA, USA). The iTRAQ reagent multi-plex kit, containing the iTRAQ reagents, was bought commercially (Applied Biosystems, Foster City, CA, USA). Experimental procedures, including the killing of animals, were in accordance with the International Guiding Principles for Animal Research (WHO) and were approved by the local Institutional Animal Care & Use Committee (NTU-IACUC). One-year-old male Wistar Kyoto rats (~250 g) were obtained from the laboratory animal centre (National University of Singapore) and randomly assigned to control and tianma-treated groups (10 each). According to previous reports and our own recent pilot studies, the average daily dose of tianma per rat was 2.5g/kg body weight [12, 18, 20-22]. They were fed a normal chow (Funabashi SP, Japan) and tap water was given freely. Room temperature (RT) was kept at 21 ± 2 ºC, with 60 % humidity, and a 12 h light/dark cycle. Tianma-feeding was done orally (intragastric administration) with a blunt needle syringe by dispensing the tianma solution for the period of three months. Control rats were treated with the same volume of the solvent only. Animals were sacrificed by CO2 asphyxiation. All efforts were made to minimize animal suffering and to reduce the number of animals used. The rhizome of Gastrodia elata (tianma), grown under standardized conditions , was collected from Zhaotong City, China and provided by Dr. Jun Zhou (Kunming Institute of Botany, Chinese Academy of Science, Yunnan, P.R. China). The species was identified and chemically analyzed as reported previously [12, 24]. A voucher specimen (0249742) was deposited in the herbarium of the Kunming Institute of Botany (Chinese Academy of Science, Yunnan, P.R. China). In this study, tianma was prepared according to previous reports [12, 16, 19, 20, 22, 25-27]. Whole dried tubers of the tianma were hammered into smaller pieces and subsequently ground to fine powder. 7.5 g of tianma powder was mixed with 100 ml sterilized Milli-Q water and boiled for 1 h at 100 ºC. The solution was centrifuged at 5000xg for 10 min at RT. The supernatant was filtered with a Whatman filter paper-1 (GE Healthcare, Chalfont St Giles, UK), yielding approximately 85 ml. The tianma solution was concentrated at 60 ºC under vacuum and the final volume was reduced to 10 ml for further applications. Briefly, the thoracic aorta was excised from the rat gently after dissection, immediately immersed into cold physiologic saline solution (PSS, 119 mM NaCl, 25 mM NaHCO3, 4.7 mM KCl, 1.18 mM KH2PO4, 1.17 mM MgSO4, 2.5 mM CaCl2, 0.026 mM EDTA and 5.5 mM glucose; the solution was gassed with 5 % CO2 in O2 to maintain pH at 7.4) and kept on ice for further careful cleaning with scissors and forceps under the microscope to remove fat and connective tissues as well as blood clots. The aorta was then cut into eight segments of 2 mm rings and kept in 4 °C-cold PSS. The integrity of the endothelium was tested by constricting with 10 µM PE and after steady contraction obtained, relaxed with 10 µM ACh [28, 29]. The myograph (Danish Myo Technology, ADInstruments S.E.Asia, Subang Jaya, Selangor, Malaysia) chambers were filled with ‘Krebs’ solution and the aorta rings mounted onto the hooks inside the chambers for isometric tension recording . The tension was adjusted to 1 g as the baseline. The tissues were then washed twice with 124 mM K+ PSS to ensure the viability. For experimental set I, the segments were initially loaded to an optimum stretch, which was previously determined by using high-K+ physiological solution (80 mM) as the contracting agent after applying different passive tensions. The initial stretch and the length of the segments (2 mm) were consistently maintained across all arterial rings of either group. The aorta rings were pre-contracted with 80 mM K+ PSS until they reached a plateau. Thereafter, an ACh-mediated relaxation was performed as a concentration response curve (CRC) by adding increasing concentrations of ACh in half-log concentration increments, i.e. 10-8 M, 3x10-8 M, 10-7 M, 3x10-7 M, 10-6 M, 3x10-6 M, 10-5 M, 3x10-5 M, and 10-4 M. After the ACh CRC, the tissues were end-relaxed by applying 5x10-5 M sodium nitroprusside (SNP). For experimental set II, the aorta rings were pre-contracted with 10-6 M PE and the ACh CRC applied. Upon reaching the PE plateau, the ACh CRC was performed by half-log (10-8 M to 10-4 M) applications of ACh. Again, after the ACh CRC, the tissues were further relaxed by applying 5x10-5 M SNP. For data analysis the weight of the dried aorta rings were measured for appropriate normalization. Contraction responses to PE were calculated as percent of its maximal contraction. Relaxant responses to ACh were calculated as percent inhibition of the K+-/PE-induced contraction. Data analysis was done using GraphPad Prism for Windows (Graph-Pad Software, San Diego, CA, USA). Data from several (8) vascular rings of the same rat were averaged and presented as the datum for 1 rat, with the n value (= 5) representing the number of rats for each group (control or tianma-treated). Differences were considered statistically significant at P < 0.05. For this purpose, PE was initially added at a final concentration of 10-7 M to the bath to contract the ring, and force was allowed to stabilize for 5 min. ACh at a final concentration of 10-5 M was then added to the pre-contracted rings for 5 min to test for endothelial integrity and aortal ring viability. If a ring failed to contract in response to PE or failed to relax in response to ACh, it was replaced with another aortic ring from the same rat. After the initial test for vessel viability and endothelial integrity, the ring was washed 3 times with PSS, allowed to equilibrate, and then re-washed with fresh PSS at 10 min intervals until the measured active force stabilized at 0 g. The maximum contraction achievable by the ring was then determined by filling the bath with 80 mM K+ and adding increasing concentrations of PE up to a final concentration of 10-4 M (a PE CRC with half-log concentrations was performed (i.e. 10-8 M, 3x10-8 M, 10-7 M, 3x10-7 M, 10-6 M, 3x10-6 M, 10-5 M, 3x10-5 M, and 10-4 M)). Maximal contractile force generated in response to the combination of 80 mM K+ and PE was normalized to the wet weight of the aortic ring (determined at the end of the experiment). After determining the maximum contraction of the aortic rings, the vessels were allowed to stabilize and washed with PSS every 10 min until the measured active force returned to 0 g.
For the aorta-tissue-specific proteome analyses, aorta tissues were isolated from tianma-treated and control rats. Briefly, the thoracic aorta was excised from the rats gently after dissection, immediately immersed into liquid nitrogen, and then powdered using a mortar and pestle. Upon the addition of lysis buffer (2 % SDS, 0.5 M Triethyl ammonium bicarbonate buffer (TEAB), 1 Complete™ protease inhibitor cocktail tablet (Roche, Mannheim, Germany) and 1 PhosSTOP phosphatase inhibitor cocktail tablet (Roche)), the samples were vortexed for 1 min and incubated on ice for an additional 45 min prior to homogenisation (sonication parameters: amplitude, 23 %; pulse: 5 s/ 5 s for 5 min) using a Vibra Cell high intensity ultrasonic processor (Jencon Scientific Ltd, Leighton Buzzard, Bedfordshire, UK). After centrifugation (20,000 x g / 4 °C / 30 min), supernatant was collected and stored at -80 °C until further use. The protein concentration was quantified by a ‘2-D Quant’ kit (Amersham, Piscataway, NJ, USA) according to the manufacturer’s protocol. A detailed description of the 2D-LC-MS/MS-iTRAQ procedures [19, 31-33], including post-proteomic data verification by SDS-PAGE - western blot analysis [34-36], can be found in the supplementary content document as described previously. Anti-Anxa2 (Annexin-A2, 1:4000, polyclonal; Abcam, Cambridge, UK), anti-Des (Desmin, 1:1000, rabbit polyclonal; Cell Signaling Technology Inc., Danvers, MA, USA), anti-Gapdh (1:1000, mouse monoclonal; Abcam), anti-Gstm2 (Glutathione S-transferase mu 2, 1:1000, goat polyclonal; Santa Cruz Biotechnology Inc., Santa Cruz, CA, USA), anti-Serpinh1 (Serpin H1, 1:1000, rabbit polyclonal; Abnova, Taipei, Taiwan), anti-Vcl (Vinculin, 1:4000, monoclonal; Abcam). The mechanical responses of the vessels were measured as force and expressed as active wall tension, which is the increase in measured force divided by twice the segment length . By using a computer program (GraphPad, Institute for Scientific Information, San Diego, CA, USA), the CRCs were fitted to the classical Hill equation, as described earlier . The results are expressed as mean ± SD. Differences between means were analyzed using either one-way analysis of variance (ANOVA) followed by a Bonferroni t-test, Student’s t-test or paired t-test (SPSS (Statistical Products and Service Solutions) for Windows Version 19 was used to perform ANOVA, optionally followed by Fisher’s Protected Least Significant Difference (PLSD) post hoc tests, when warranted). For the western blot analyses the Student’s t-test was applied accordingly. For the iTRAQ analysis ProteinPilot Software 3.0 was used as described above. To be considered statistically significant, we required a probability value to be at least < 0.05 (95 % confidence limit, *P < 0.05). In order to investigate the vasodilatory effects of tianma on blood vessels, we used myography to perform contractility/relaxation reactivities by using isolated thoracic aortic rings from rats treated with/without tianma (~2.5g/kg/day for three months). As shown in Figs. 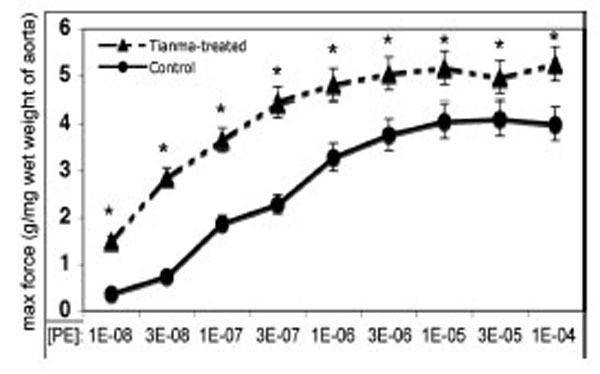 (2 and 3), in the endothelium-intact thoracic aortic rings, ACh-induced smooth muscle relaxation was obviously enhanced by tianma treatment in both K+ (80 mM)- (Fig. 2) and PE- (10-6 M) (Fig. 3) induced pre-contraction. It was noticed that in PE-induced pre-contraction,tianma treatment enhanced ACh-induced endothelium-dependent smooth muscle relaxation up to about 20 %, whereas in K+-induced pre-contraction, tianma treatment only enhanced ACh-induced endothelium-dependent smooth muscle relaxation to about 10 %. The different mechanisms of K+- and PE-induced smooth muscle contraction could account for the different enhancing relaxatory effects by tianma. Tianma enhanced ACh-induced vasorelaxation in endothelium-intact rat thoracic arterial rings (I). Analysis of ACh induced relaxations in KCl (80 mM) pre-contracted isolated endothelium-intact arterial rings from control and tianma-treated rats. One-year-old rats were treated with or without tianma for three months at ~2.5g/kg/day and the thoracic aortas were isolated. The endothelium-intact arterial rings were first pre-contracted by 80 mM of K+. Increasing concentrations of ACh were added and then the percentage of ACh-induced relaxation to K+ contraction was measured as described in the materials and methods. Data points represent means ± SD of measurements in 8 arterial rings from 5 rats of each group (*P < 0.05 compared with the control group). Tianma enhanced ACh-induced vasorelaxation in endothelium-intact rat thoracic arterial rings (II). Analysis of ACh induced relaxations in PE (10-6 M) pre-contracted isolated endothelium-intact arterial rings from control and tianma-treated rats. One-year-old rats were treated with or without tianma for three months at ~2.5g/kg/day and the thoracic aortas were isolated. The endothelium-intact arterial rings were first pre-contracted by PE (10-6 M). Increasing concentrations of ACh were added and then the percentage of ACh-induced relaxation to PE (10-6 M) contraction was measured as described in the materials and methods. Data points represent means ± SD of measurements in 8 arterial rings from 5 rats of each group (*P < 0.05 compared with the control group). Tianma almost doubled the contractile forces of the thoracic aortic rings in response to PE and promoted the arrival of the plateau (maximal contractile force) (Fig. 4). 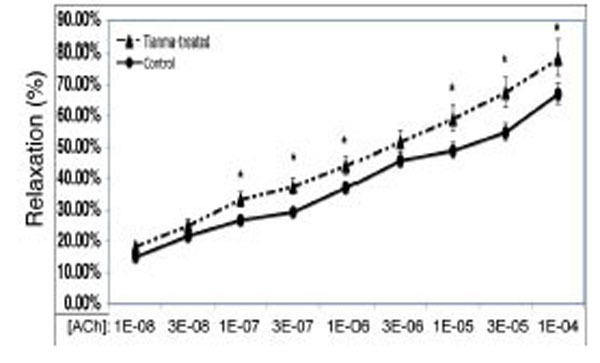 The concentration of PE required for reaching the plateau in the tianma treated group is about 10-6 M, which is about 10 times less than in the control group (10-5 M). Thus, the potential vasodilatory effect of tianma on smooth muscles could eventually enhance the maximal contractile response to PE, which could be interpreted as an effect that may enhance blood vessel elasticity. Tianma increased the contractile force and elasticity of the thoracic aortic rings. Comparison of maximum contractile force developed in response to 80 mM K+ and increasing concentrations (CRCs) of PE in aortic rings from tianma-treated rats and controls. The isolated endothelium-intact arterial rings were studied with the endothelium left intact and data are presented as tension (g) per milligram tissue wet weight (g/mg wet weight of aorta). Values represent an average of 2x8 individual experiments. An asterisk indicates a significant difference from the control value (*P < 0.05 compared to the control group). iTRAQ analysis was performed on the purified protein extracts from rat thoracic aortas with or without tianma treatment to understand the mechanism of tianma-mediated relaxation in vascular smooth muscle strips on the cellular and molecular level. Four samples set into two batches (each batch (B-I, B-II) contained five tianma-treated samples and five (untreated) control samples) were subjected to iTRAQ analysis in order to ensure the results were statistically meaningful. Identified proteins were also visualized in a virtual two-dimensional protein gel, JVirGel, and categorized by their calculated isoelectric points and molecular weights . The protein spots were well separated without aggregation, indicating a well-qualified whole cell proteomic pattern (Fig. 5). Simulated 2D gel presentation of rat thoracic aorta-derived quantified proteins. MW and pI values generated from JVirGel (http://www.jvirgel.de/). The proteins identified by LC-MS/MS were uploaded onto JVirGel, online software used to create a 2D gel image. This image confirmed that the tissue lysis performed was adequate and the entire proteome within cells was extracted. We identified a total of 1298 proteins through iTRAQ analysis out of which 1166 proteins were quantified (with a strict cutoff of unused ProtScore ≥ 2 as the qualification criteria, which corresponds to a peptide confidence level of 99 % and an applied FDR (false discovery rate) of 0.33% (<1.0%)). Comparing the expression levels between tianma-treated and untreated samples, 54 proteins showed an altered expression level (30 proteins were down-regulated and 24 proteins were up-regulated, (Supplementary data: Table 1)). We used Panther, UniProt, and NCBI online databases for classifying the altered proteins based on their role and localization. 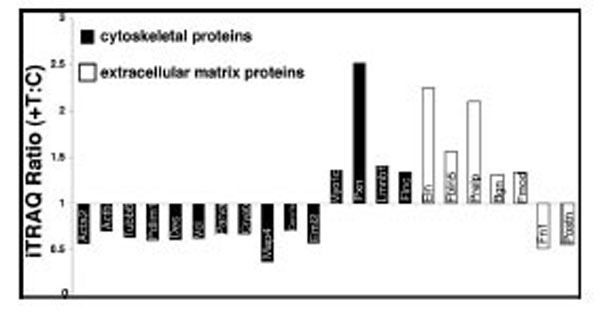 Approximately 33.30 % of the altered proteins were cytoskeletal, 26 % were catalytic and 10 % were extracellular matrix (ECM) proteins (Fig. 6). Pie chart depicting the iTRAQ identified proteins characterized by the molecular function GO category. 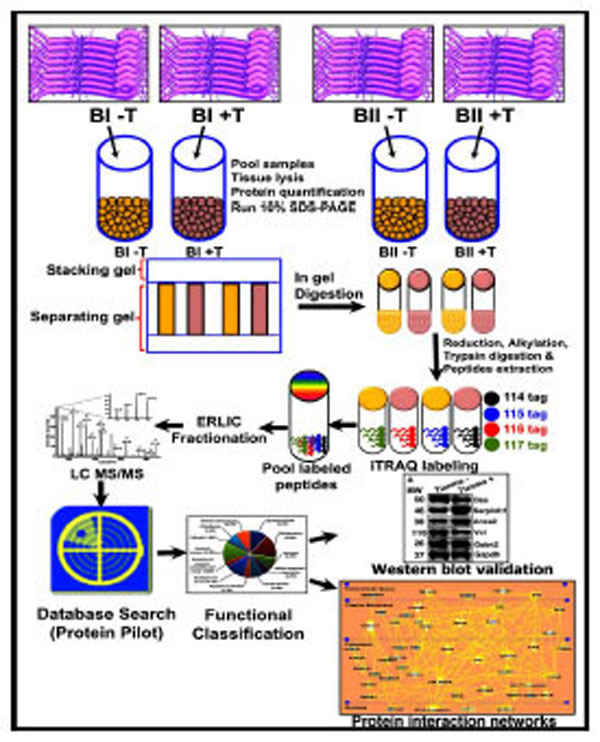 Proteins identified and quantified by iTRAQ, were classified in terms of their role in biological processes (A) and molecular functions (B). We focused our interest on the structural protein subgroup: In tianma treated aortic rings, actin (Acta2) decreased to about half the level of the control (with p<0.02) while other structural proteins, like desmin (Des), vinculin (Vcl), PDZ and LIM domain protein 1 (Pdlim1), tubulin beta 6 (Tubb6), alpha-parvin (Parva) and microtubule-associated protein-4 (Map4) were also down-regulated by tianma treatment upto 30 % - 60 %, whereas Myo1c and lamin-B1 (Lmnb1) were up-regulated. Most ECM/cell-surface proteins were also up-regulated. Elastin (Eln) and proline arginine-rich end leucine-rich repeat protein (Prelp) expressions were increased to more than twice of the control while fibulin-5 (Fbln5), biglycan (Bgn) and fibromodulin (Fmod) expressions were also increased to more than 1.3 times of the control. In contrast, fibronectin (Fn1) and periostin (Postn) were down-regulated to about half of the control level (Fig. 7). Effect of tianma on the expression levels of cytoskeletal and ECM proteins. Protein expression levels were quantitatively analyzed ex-vivo by using iTRAQ after tianma treatment for three months as described in the experimental procedures. 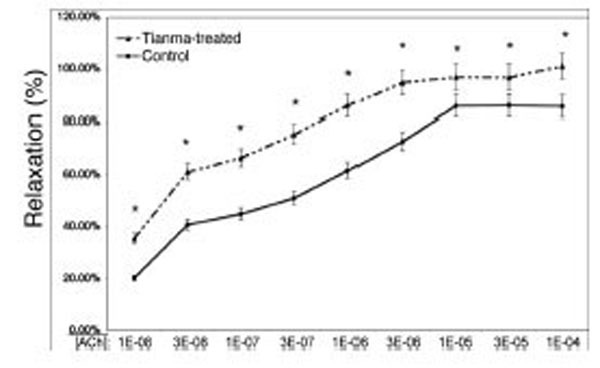 The Y-axis shows the iTRAQ ratios of proteins between tianma-treated and untreated controls. Values above 1.2 indicate up-regulation and below 0.83 indicate down-regulation of the proteins. Proteins shown (from left to right): black bars: down-regulated: Acta2, Actb, Tubb6, Pdlim1, Des, Vcl, Parva, Cryab, Map4, Coro1c, Eml2, up-regulated: Myo1c, Pxn, Lmnb1, Flnc. White bars: up-regulated: Eln, Fbln5, Prelp, Bgn, Fmod; down-regulated: Fn1, Postn. Following the database search and classification of proteins, western blots were performed on randomly selected proteins to further verify the iTRAQ results (Fig. 8). While Gstm2, Des and Vcl were down-regulated by tianma treatment, the smooth muscle cell-specific serine (or cysteine) peptidase inhibitor Serpinh1 (also known as 47 kDa heat shock protein; beta enolase repressor factor 1; collagen binding protein 1) and Anxa2 were up-regulated. Notably, the western blot images correlated very well and thus confirmed the iTRAQ data obtained. Western blot validation of iTRAQ results. Randomly selected proteins significantly regulated in tianma-stimulated rat aortas compared with controls. Rats were treated, proteins extracted and western blot performed as described in materials and methods. A: Serpinh1, Anxa2 and Gstm2 expressions were up-regulated, while Vcl and Des expressions were down-regulated. Gapdh, that did not show any change in the iTRAQ data set, was used as reference protein. B: Quantitative analyses of the western blots shown in A. Western blots were performed at least four times for statistical quantification and analyses (n=4). Values (= relative protein expression) represent the ratio of densitometric scores for the respective western blot products and statistical error was indicated as mean ± SD (*P < 0.05, compared with controls) using the Gapdh bands as reference. C: The histogram indicates a similar close relationship between iTRAQ and western blot expression ratios. Tianma-stimulated and control aorta iTRAQ expression ratios from selected proteins were consistent with the western blot results and thus validated a strong agreement in the expression data. The STRING (Search Tool for the Retrieval of Interacting Genes) analyses provided us an essential systems-level understanding of cellular events, including both physical and functional interactions, in a tianma-treated aorta . Our current study revealed the functional link among ECM and cytoskeletal proteins such as Bgn, Fn1, Vcl, Acta2, Actb, Tubb6, Des, Myo1c or Pxn and their potential link to other metabolically modulated proteins such as Suclg1, Sdha and Slc25a4/5 (Fig. 9). STRING-9.0 analysis (rattus norvegicus at http://string-db.org/; default mode) of tianma-modulated proteins in rat aorta. Different line colors represent the types of evidence for the association. Network display: Nodes are either colored (if they are directly linked to the input as in supplemental table 1) or white (nodes of a higher iteration). Edges, i.e. predicted functional links, consist of multiple lines: one color for each type of evidence. Further bio-computational network analysis of the proteins identified in tianma-stimulated aortic tissue using the Ingenuity Pathways Analysis (IPA) offered us additional valuable clues about the complex interactive link of various identified proteins within their interactive protein networks obtained from other cellular metabolic information (Fig. 10). IPA network analysis of proteins identified by iTRAQ in the aorta and their potential functional link to other proteins in human cells (in various tissues, under various conditions). The six major IPA-provided networks were analyzed based on the data of proteins expressed in rat aorta. 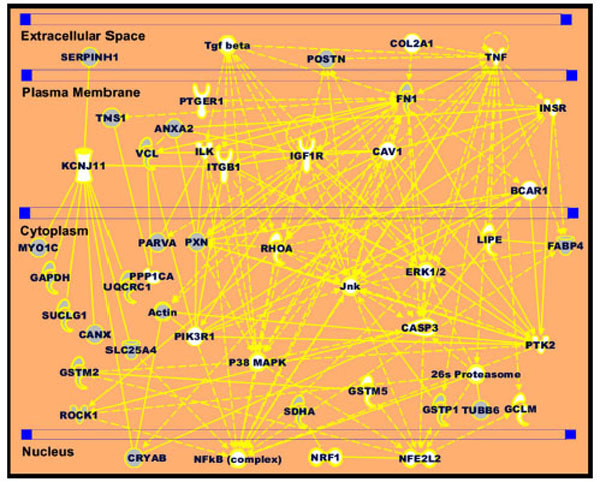 The network (i) considered 14 proteins (Actin, BCAR1, CANX, CASP3, CAV1, CRYAB, GAPDH, GLMC, GCLM, GSTM1, GSTM5, GSTP1, ILK, ITGB1, KCNJ11, MYO1C, NFE2L2, PARVA, PIK3R1, PPP1CA, PTK2, PXN, SERPINH1, SLC25A4, SUCLG1, TNF, TNS1, UQCRC1, VCL) involved in necrosis/cell death, cell morphology. Network (ii) considered proteins (26S Proteasome, TUBB6) involved in the cardiovascular system development and function. Network (iii) considered proteins (RHOA, ROCK1) involved in cell morphology, cellular development, nervous system development and function. 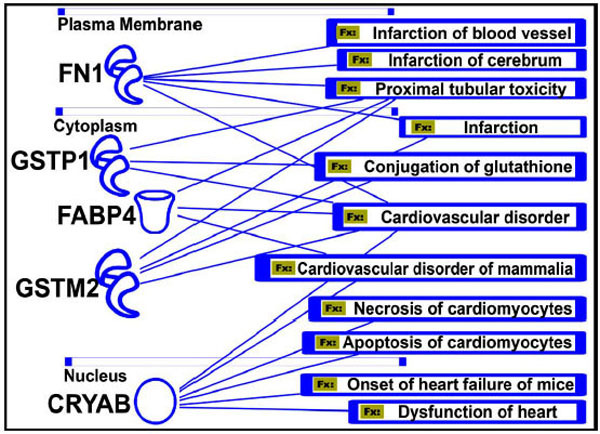 Network (iv) considered proteins (FABP4, LIPE) in-volved genetic disorders and lipid metabolic diseases. Network (v) considered proteins (NRF1, SDHA) involved in lipid metabolism, small molecule biochemistry, connective tissue development and function. Network (vi) considered proteins (ANXA2, IGF1R, INSR) involved in organ morphology, cell-to-cell signaling and interaction and embryonic development. The solid lines show direct proteinprotein interaction, while dotted lines show indirect interactions between the proteins. Proteins identified by iTRAQ, as shown in Supplemental Table 1, are pre-sented in grey-color circles, while additional interaction proteins were added by the IPA network analysis in white color. The blood vessel tonicity is principally controlled by the contraction and relaxation of vascular smooth muscle cells. Upon stimulation, smooth muscle cells develop a contractile force by using the cross-bridge cycling between the contractile proteins actin and myosin initiated by the Ca2+-calmodulin interaction and modulated by many other proteins [39-44]. 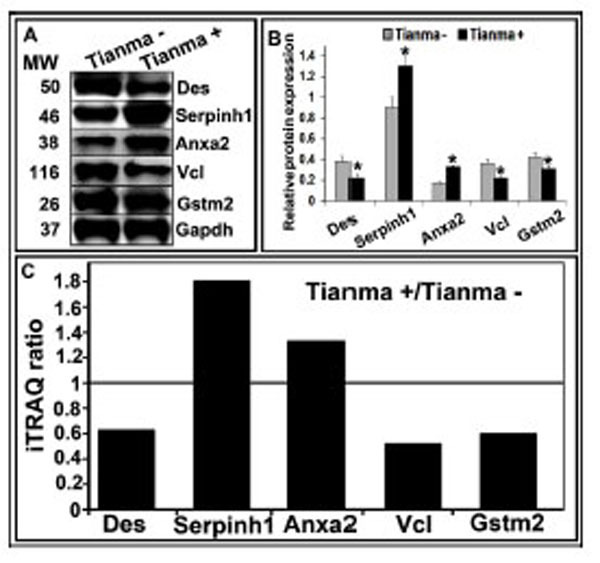 According to our results, long-term treatment with small doses of tianma resulted in a significant decrease of the expression levels of primary contractile protein actin to about half the level of the controls, as well as other cytoplasmic structural/cytoskeletal proteins, like Des, Vcl, Pdlim1 and Map4. Des is a muscle-specific structural protein highly expressed in all three types of muscle cells . Des-filaments are largely distributed around the Z-disk of striated muscles and the dense bodies of smooth muscle cells, and connect the contractile apparatus to the subsarcolemmal cytoskeleton and other cellular organelles to maintain the mechanical integrity of the contractile apparatus in muscle cells [43, 46-48]. Likewise, Vcl can be detected in actin-filament attachment areas in the dense plaques of smooth muscle cells and plays a role in linking actin bundles to cell membranes [49, 50], Pdlim1 and Map4 are involved in restructuring the cytoskeletal system [51, 52]. Thus, tianma could eventually facilitate vasodilation and vascular remodeling by blocking contractile and structural proteins . The up-regulated ECM glycoproteins in blood vessels, such as Eln, Fbln5 and Prelp, are essential to maintain arterial morphogenesis and vessel elasticity. In addition, these proteins can induce a quiescent contractile state in vascular smooth muscle cells [54-57]. In contrast, the down-regulated Postn is a heterofunctional secreted ECM protein that promotes cellular adhesion and movement as well as collagen fibrillogenesis . As a secreted ECM protein that associates with areas of fibrosis, Postn can directly interact with other ECM proteins such as fibronectin, tenascin-C, collagen I, collagen V, and heparin. In the adult, Postn expression is specifically induced in areas of tissue injury or areas with ongoing cellular re-organization such as in the ventricles following myocardial infarction, pressure overload stimulation, or generalized cardiomyopathy . Similarly, the small heat-shock protein Cryab seems to be up-regulated mainly upon injury events . Thus, tianma could also regulate blood vessel tonicity through affecting the expression of ECM proteins to increase the elastic property of aorta and to stabilize the arterial structure as indicated by the enhanced thoracic aortic contractile force upon tianma treatment. Anxa2, a member of the annexin family, is a calcium-regulated phospholipid binding protein expressed on a number of cell types including endothelial cells which line the blood vessel wall [60-63]. Decreased binding of Anxa2 to endothelial cells contributes to atherothrombotic disease and elevated Anxa2 expression by tianma treatment indicates that it could improve blood circulation through increasing blood flow and preventing thrombosis. Furthermore, tianma inhibited the protein expression of the fatty acid binding protein 4 (Fabp4) which belongs to the family of lipid chaperones that control intracellular fluxes and compartmentalization of their respective ligands (e.g. fatty acids). Recently it has been demonstrated that reduced levels of Fabp4, as shown in tianma-treated aortic tissue, may protect against atherosclerosis and other cardiovascular and metabolic diseases such as diabetes and obesity [64-68]. In addition, IPA analysis could demonstrate the involvement of the iTRAQ-based analysis-identified proteins and their metabolic interactive pathways within a cardiovascular network associated with specific cardiovascular diseases, eventually important for the proper functions of active blood vessels in the circulation system during regenerative processes (Fig. 11). Protein function and human diseases (Fx). Five important proteins that are involved in various cardiovascular disorders are shown. The significance of their role in these diseases needs to be explored to develop more specific drugs targeting those genes or proteins. In summary, our ex vivo study reveals a vasodilatory effect of tianma and the potential molecular mechanisms involved in this process: (i) restriction of contractile activity in smooth muscle cells through the inhibition of contractile and structural proteins; and (ii) increasing the arterial elasticity and stabilizing the arterial structure through modulating the expression of ECM proteins. Since many cardio- and cerebro-vascular diseases, such as hypertension, atherosclerosis, stroke and headache, are closely related to the abnormal contraction of vascular smooth muscles, decrease of arterial elasticity and increase of blood coagulation [44, 69], the disclosure of all the bioactive ingredients would facilitate the application of tianma as an efficient therapeutic herbal medicine [6, 12, 24, 70-73]. This study was supported by the Institute of Advanced Studies, Nanyang Technological University. We thank Mr. M. Li, (Institute of Advanced Studies) and Dr. W. Liang (School of Biological Sciences) for technical assistance. Rates S M. Plants as source of drugs Toxicon, 2001; 39(5): 603-13. Rishton G M. Natural products as a robust source of new drugs and drug leads: past successes and present day issues Am J Cardiol 2008; 101(10A): 43D-9D. Butler A R. Traditional Chinese herbal medicine Rep Proc Scott Soc Hist Med 1992; (93-94): 16-8. Ojemann L M, Nelson W L, Shin D S, Rowe A O, Buchanan R A. Tian ma, an ancient Chinese herb, offers new options for the treatment of epilepsy and other conditions Epilepsy Behav 2006; 8(2): 376-83. Bulpitt C J, Li Y, Bulpitt P F, Wang J. The use of orchids in Chinese medicine J R Soc Med 2007; 100(12): 558-63. Hew C S, Yong J W H. Orchids in Chinese medicine Innovation 2007; 6: 2-4. Xu J, Guo S. Retrospect on the research of the cultivation of Gastrodia elata Bl, a rare traditional Chinese medicine Chin Med J 2000; 113(8): 686-92. Baek N I, Choi S Y, Park J K, et al. Isolation and identification of succinic semialdehyde dehydrogenase inhibitory compound from the rhizome of Gastrodia elata Blume Arch Pharm Res 1999; 22(2): 219-24. Xiao Y Q, Li L, You X L. [Studies on chemical constituents of effective part of Gastrodia elata] Zhongguo Zhong Yao Za Zhi 2002; 27(1): 35-6. Ong E S, Heng M Y, Tan S N, et al. Determination of gastrodin and vanillyl alcohol in Gastrodia elata Blume by pressurized liquid extraction at room temperature J Sep Sci 2007; 30(13): 2130-7. Teo C C, Tan S N, Yong J W, Hew C S, Ong E S. Evaluation of the extraction efficiency of thermally labile bioactive compounds in Gastrodia elata Blume by pressurized hot water extraction and microwave-assisted extraction J Chromatogr A 2008; 1182(1): 34-40. Mishra M, Huang J, Lee Y Y, et al. Gastrodia elata modulates amyloid precursor protein cleavage and cognitive functions in mice Biosci Trends 2011; 5(3): 129-138. Pyo M K, Jin J L, Koo Y K, Yun-Choi H S. Phenolic and furan type compounds isolated from Gastrodia elata and their anti-platelet effects Arch Pharm Res 2004; 27(4): 381-385. Buemi M, Corica F, Marino D, et al. Cardiovascular remodeling, apoptosis, and drugs Am J Hypertens 2000; 13(4 Pt 1): 450-4. Owens G K, Kumar M S, Wamhoff B R. Molecular regulation of vascular smooth muscle cell differentiation in development and disease Physiol Rev 2004; 84(3): 767-801. Wang S, Chen Y, He D, et al. Inhibition of vascular smooth muscle cell proliferation by serum from rats treated orally with Gastrodia and Uncaria decoction, a traditional Chinese formulation J Ethnopharmacol 2007; 114(3): 458-62. Hayashi J, Sekine T, Deguchi S, et al. Phenolic compounds from Gastrodia rhizome and relaxant effects of related compounds on isolated smooth muscle preparation Phytochemistry 2002; 59(5): 513-9. Teong I W J, Ko A A R, Li M, Heese K, Liang W. Gastrodia elata decreases isoprenaline potency and enhances spontaneous phasic activity in the rat detrusor Int J Physiol Pathophysiol Pharmacol 2011; 3(1): 29-37. Sundaramurthi H, Manavalan A, Ramachandran U, Hu J M, Sze S K, Heese K. Phenotyping of tianma-stimulated differentiated rat neuronal b104 cells by quantitative proteomics Neurosignals 2012; 20(1): 48-60. Chen P J, Hsieh C L, Su K P, et al. The antidepressant effect of Gastrodia elata. Bl. on the forced-swimming test in rats Am J Chin Med 2008; 36(1): 95-106. Brundin P, Li J Y, Holton J L, Lindvall O, Revesz T. Research in motion: the enigma of Parkinson's disease pathology spread Nat Rev Neurosci 2008; 9(10): 741-5. Ho S C, Ho Y F, Lai T H, Liu T H, Wu R Y. Traditional Chinese herbs against hypertension enhance memory acquisition Am J Chin Med 2005; 33(5): 787-95. Zhang G M, Yang L X. Research and Development of Zhaotong Tianma. China: Yunnan Science and Techonology Press 2007; pp. 86-91. Li N, Wang K J, Chen J J, Zhou J. Phenolic compounds from the rhizomes of Gastrodia elata J Asian Nat Prod Res 2007; 9(3-5): 373-7. Hsieh C L, Lin J J, Chiang S Y, et al. Gastrodia elata modulated activator protein 1 via c-Jun N-terminal kinase signaling pathway in kainic acid-induced epilepsy in rats J Ethnopharmacol 2007; 109(2): 241-7. Ho S C, Ho Y F, Lai T H, Liu T H, Su S Y, Wu R Y. Effect of Tianma Gouteng Decoction with subtractive ingredients and its active constituents on memory acquisition Am J Chin Med 2008; 36(3): 593-602. Jang Y W, Lee J Y, Kim C J. Anti-asthmatic activity of phenolic compounds from the roots of Gastrodia elata Bl Int Immunopharmacol 2010; 10(2): 147-54. Osol G, Cipolla M, Knutson S. A new method for mechanically denuding the endothelium of small (50-150 microns) arteries with a human hair Blood Vessels 1989; 26(5): 320-4. Simonsen U, Garcia-Sacristan A, Prieto D. Apamin-sensitive K+ channels involved in the inhibition of acetylcholine-induced contractions in lamb coronary small arteries Eur J Pharmacol 1997; 329(2-3): 153-63. Mulvany M J, Halpern W. Contractile properties of small arterial resistance vessels in spontaneously hypertensive and normotensive rats Circ Res 1977; 41(1): 19-26. Datta A, Park J E, Li X, et al. Phenotyping of an in vitro model of ischemic penumbra by iTRAQ-based shotgun quantitative proteomics J Proteome Res 2010; 9(1): 472-84. Datta A, Jingru Q, Khor T H, Teo M T, Heese K, Sze S K. Quantitative neuroproteomics of an in vivo rodent model of focal cerebral ischemia reperfusion injury reveals a temporal regulation of novel pathophysiological molecular markers J Proteome Res 2011; 10(11): 5199-213. Mishra M, Manavalan A, Sze S K, Heese K. Neuronal p60TRP expression modulates cardiac capacity J Proteomics 2012; 75(5): 1600-17. Islam O, Loo T X, Heese K. Brain-derived neurotrophic factor (BDNF) has proliferative effects on neural stem cells through the truncated TRK-B receptor, MAP kinase, AKT, and STAT-3 signaling pathways Curr Neurovasc Res 2009; 6(1): 42-53. Shen Y, Inoue N, Heese K. Neurotrophin-4 (ntf4) mediates neurogenesis in mouse embryonic neural stem cells through the inhibition of the signal transducer and activator of transcription-3 (stat3) and the modulation of the activity of protein kinase B Cell Mol Neurobiol 2010; 30(6): 909-916. Mishra M, Akatsu H, Heese K. The novel protein MANI modulates neurogenesis and neurite-cone growth J Cell Mol Med 2011; 15(8): 1713-1725. Hiller K, Schobert M, Hundertmark C, Jahn D, Munch R. JVirGel: Calculation of virtual two-dimensional protein gels Nucleic Acids Res 2003; 31(13): 3862-5. Szklarczyk D, Franceschini A, Kuhn M, et al. 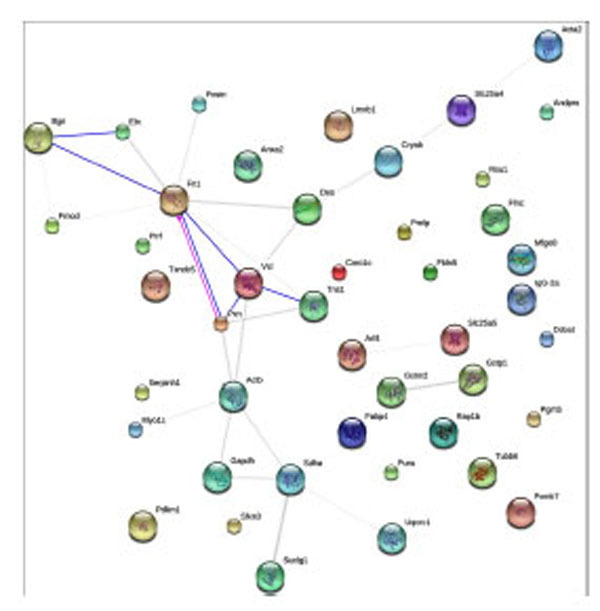 The STRING database in 2011: functional interaction networks of proteins, globally integrated and scored Nucleic Acids Res 2011; 39(Database issue): D561-D568. Kolakowski J, Makuch R, Stepkowski D, Dabrowska R. Interaction of calponin with actin and its functional implications Biochem J 1995; 306( Pt 1): 199-204. Szymanski P T, Tao T. Interaction between calponin and smooth muscle myosin FEBS Lett 1993; 334(3): 379-82. Pardo J V, Siliciano J D, Craig S W. Vinculin is a component of an extensive network of myofibril-sarcolemma attachment regions in cardiac muscle fibers J Cell Biol 1983; 97(4): 1081-8. Craig S W, Pardo J V. Gamma actin, spectrin, and intermediate filament proteins colocalize with vinculin at costameres, myofibrilto-sarcolemma attachment sites Cell Motil 1983; 3(5-6): 449-62. Costa M L, Escaleira R, Cataldo A, Oliveira F, Mermelstein C S. Desmin: molecular interactions and putative functions of the muscle intermediate filament protein Braz J Med Biol Res 2004; 37(12): 1819-30. Webb R C. Smooth muscle contraction and relaxation Adv Physiol Educ 2003; 27(1-4): 201-6. Lazarides E, Hubbard B D. Immunological characterization of the subunit of the 100 A filaments from muscle cells Proc, Natl Acad Sci, USA 1976; 73(12): 4344-8. Hubbard B D, Lazarides E. Copurification of actin and desmin from chicken smooth muscle and their copolymerization in vitro to intermediate filaments J Cell Biol 1979; 80(1): 166-1082. Paulin D, Li Z. Desmin: a major intermediate filament protein essential for the structural integrity and function of muscle Exp Cell Res 2004; 301(1): 1-7. Milner D J, Weitzer G, Tran D, Bradley A, Capetanaki Y. Disruption of muscle architecture and myocardial degeneration in mice lacking desmin J Cell Biol 1996; 134(5): 1255-70. Geiger B, Tokuyasu K T, Dutton A H, Singer S J. Vinculin, an intracellular protein localized at specialized sites where micro-filament bundles terminate at cell membranes Proc Natl Acad Sci USA 1980; 77(7): 4127-31. Evans R R, Robson R M, Stromer M H. Properties of smooth muscle vinculin J Biol, Chem 1984; 259(6): 3916-24. Chinnakkannu P, Samanna V, Cheng G, et al. Site-specific microtubule-associated protein 4 dephosphorylation causes microtubule network densification in pressure overload cardiac hypertrophy J Biol Chem 2010; 285(28): 21837-48. Tamura N, Ohno K, Katayama T, Kanayama N, Sato K. The PDZ-LIM protein CLP36 is required for actin stress fiber formation and focal adhesion assembly in BeWo cells Biochem Biophys Res Commun 2007; 364(3): 589-94. Makinen T, Adams R H, Bailey J, et al. PDZ interaction site in ephrinB2 is required for the remodeling of lymphatic vasculature Genes Dev 2005; 19(3): 397-410. Li DY, Brooke B, Davis E C, et al. Elastin is an essential determinant of arterial morphogenesis Nature 1998; 393(6682): 276-280. Karnik S K, Brooke B S, Bayes-Genis A, et al. A critical role for elastin signaling in vascular morphogenesis and disease Development 2003; 130(2): 411-423. Argraves W S, Tran H, Burgess W H, Dickerson K. Fibulin is an extracellular matrix and plasma glycoprotein with repeated domain structure J Cell Biol 1990; 111(6 Pt 2): 3155-3164. Bengtsson E, Morgelin M, Sasaki T, Timpl R, Heinegard D, Aspberg A. The leucine-rich repeat protein PRELP binds perlecan and collagens and may function as a basement membrane anchor J Biol Chem 2002; 277(17): 15061-16068. Conway S J, Molkentin J D. Periostin as a heterofunctional regulator of cardiac development and disease Curr Genomics 2008; 9(8): 548-555. Liu S, Piatigorsky J. Regulation of mouse small heat shock protein alphab-crystallin gene by aryl hydrocarbon receptor PLoS ONE 2011; 6(4): e17904. Cesarman G M, Guevara C A, Hajjar K A. An endothelial cell receptor for plasminogen/tissue plasminogen activator (t-PA). II. Annexin II-mediated enhancement of t-PA-dependent plasminogen activation J Biol Chem 1994; 269(33): 21198-21203. Hajjar K A, Jacovina A T, Chacko J. An endothelial cell receptor for plasminogen/tissue plasminogen activator. I. Identity with annexin II J Biol Chem 1994; 269(33): 21191-21197. Dudani A K, Pluskota A, Ganz P R. Interaction of tissue plasminogen activator with a human endothelial cell 45-kilodalton plasminogen receptor Biochem Cell Biol 1994; 72(3-4): 126-31. Flood E C, Hajjar K A. The annexin A2 system and vascular homeostasis Vascul Pharmacol 2011; 54(3-6): 59-67. Suhre K, Romisch-Margl W, de Angelis M H, Adamski J, Luippold G, Augustin R. Identification of a potential biomarker for FABP4 inhibition: the power of lipidomics in preclinical drug testing J Biomol Screen 2011; 16(5): 467-75. Ordovas J M. Identification of a functional polymorphism at the adipose fatty acid binding protein gene (FABP4) and demonstration of its association with cardiovascular disease: a path to follow Nutr Rev 2007; 65(3): 130-4. Frayn K N, Fielding B A, Karpe F. Adipose tissue fatty acid metabolism and cardiovascular disease Curr Opin Lipidol 2005; 16(4): 409-15. Storch J, Thumser A E. Tissue-specific functions in the fatty acid-binding protein family J Biol Chem 2010; 285(43): 32679-83. Furuhashi M, Hotamisligil G S. Fatty acid-binding proteins: role in metabolic diseases and potential as drug targets Nat Rev Drug Discov 2008; 7(6): 489-503. Cernes R, Zimlichman R, Shargorodsky M. Arterial elasticity in cardiovascular disease: focus on hypertension, metabolic syndrome and diabetes Adv Cardiol 2008; 45: 65-81. Sa Q, Wang Y, Li W, Zhang L, Sun Y. The promoter of an antifungal protein gene from Gastrodia elata confers tissue-specific and fungus-inducible expression patterns and responds to both salicylic acid and jasmonic acid Plant Cell Rep 2003; 22(1): 79-84. Liu W, Hu Y L, Wang M, Xiang Y, Hu Z, Wang D C. Purification, crystallization and preliminary X-ray diffraction analysis of a novel mannose-binding lectin from Gastrodia elata with antifungal properties Acta Crystallogr D Biol Crystallogr 2002; 58(Pt 10 Pt 2): 1833-5. Bulpitt C J. The uses and misuses of orchids in medicine Q J M 2005; 98(9): 625-31. Schachter S C. Botanicals and herbs: a traditional approach to treating epilepsy Neurotherapeutics 2009; 6(2): 415-20.